MMHR covered the 19th edition of the Nike Extravaganza at Meruelo Athletic Center on the campus of Mater Dei High School. Day 2 had two sessions,three games in the morning session and twice the fun in the evening session. Both teams came out slow because an early tip off of 8:30am. The 1st quarter ended in a 12-10 lead for Colony. Los Al woke up and put together a 17 point 2nd quarter and shut down Colony(6 points) to take a 27-18 halftime lead. Eyassu Worku(2016), 6’0″ G, led the assault with 11 points. In the 2nd half Derrick Bruce(2014), 6’3″ G, led Colony with 10 points and 17 for the game. Jack Kaub(2015), 6’6″ F, teamed up with Worku to score 14 points and 14 rebounds. Worku finished with 16 points to lead Los Al to a 57-42 win. Serra and Upland came out strong with the Cavaliers leading 18-15 at the end of the 1st quarter. Serra forced 19 turnovers along with a 30 point 2nd quarter to take a 48-23 halftime lead. The second half was the same as Serra pushed its lead to as much as 39 points to win 81-50. Upland was led by Deangelo Stowers(2014), 6’1″ G, with 15 points and Marquis Reed(2015), 6’4″ F, with 14 points. Serra had five players in double figures. Tavrion Dawson, a CS Northridge signee, had 21 points. Jason Richardson(2015), 6’2″ PG, had 10 points/7 assists/0 turnovers. Ian Carter(2016, 6’7″ F, led the Cavs with 6 rebounds along with 10 points. Fairfax came out fast and took a 18-10 lead in the 1st quarter. The second quarter was a draw as Fairfax led 28-20 at half. In the 3rd quarter Fairfax limited Alemany to 5 points to increase its lead to 42-25 going into the 4th. Alemany played with a sense of urgency and outscored Fairfax 24-9 to force overtime. In OT, Alemany outscored Fairfax 5-3 to pull out the victory 54-52. Daron Henson(2016), 6’7″ PF, led Alemany with 16 points including hitting 4 three pointers. Brandon Boyd(2014), 6’0″ PG, had 16 points as well. Kevin Summers(2015), 6’5″ PF, had a double-double of 11 points and 10 rebounds. Fairfax was led by Sage Woodruff(2014), 6’5″ F, with 11 points. Lorne Currie(2015), 6’2″ G, had 10 points as well as Pierson Ro(2014), 6’6″ F.
In the 1st quarter, Centennial came out on fire and led 24-18 after 8 minutes of play. Redondo responded and outscored the Huskies 19-18 to take a 35-32 lead at the half. In the 3rd quarter, Centennial was able to handle the pressure of Redondo and scored 21 points in the quarter to take a 8 point lead into the 4th. The last 8 minutes was a back and forth affair with the Huskies beating the Seahawks 67-60. Centennial was led by Long Beach State signee Deontae North(2014) with 19 points and 10 rebounds and Sedrick Barefield(2015), 6’1″ G, with 17 points. Redondo was led by Ian Fox(2014), 6’0″ G, with 17 points. Leland Green(2016), 6’2″ SG, had 14 points and 11 rebounds. Terrell Carter(2014), 6’8″ PF, had 11 points and 10 rebounds. Orange Lutheran won a close game through out with 11 lead changes and 7 ties 60-54. The Lancers were led by Rogers Printup(2015), 6’5″ G, 17 points. Keisean Lucier-South(2015), 6’6″ F, had 14 points and 14 rebounds. Foothill was led by Eric Patton(2015), 6’6″ F, with 16 points and Riley O’Hern(2015), 6’0″G, with 13 points. 3-time defending Nevada State Champion Gorman came out to California and played JSerra. With a starting front court of 6’6″, 6’10”, and 7’0″, the Gaels would seem to match up better with a NBA team instead of a high school team. The Lions were up to the challenge. Through three quarters, JSerra battled Gorman to a stand still and went into the 4th quarter down 5 points. In the 4th quarter, Gorman demonstrated its toughness and pulled away for a 15 point win, 68-53. The Gaels were led by Chase Jeter(2015), 6’10” F/C, with 19 points/11 rebounds/3 Blocked Shots. Noah Robotham(2014), 6’0″ G, had 17 points and Nick Blair(2015), 6’6″ F, had 11 points. JSerra was led by Northwestern commit Johnnie Vasser with 21 points. Etiwanda came out slow against Bosco. The 1st quarter was 14-9 in favor of the Braves. Bosco caught whatever was ailing the Eagles in the 2nd quarter and scored 8 points. Etiwanda did no better and scored 7 points to make the halftime score 22-16. In the second half including OT, it was the Jordan McLaughlin show. The USC commit scored 30 points in 21 minutes of play on NBA three balls ala Steph Curry. He personally willed Etiwanda to the victory with his scoring and penetration and dish. Etiwanda won 62-53. Kameron Edwards(2015), 6’5″ F, had 16 points and 11 rebounds. Bosco was led by UCONN signee Daniel Hamilton with 18 points. Tyler Dorsey, Arizona verbal commit, had 15 points and 11 rebounds. This game featured one of the Los Angeles City Section powers against one of the storied programs in America. The 1st quarter was a pedestrian one as Westchester took an early lead of 12-9. In the 2nd quarter, Dematha woke up and scored 14 points but the Comets scored 20 points to take a 32-23 lead at the half. During halftime, Dematha must have gotten their second wind. The Stags scored 21 points against 11 for Westchester to take a 1 point lead into the 4th quarter. The 4th quarter was a defensive battle as Westchester scored 10 points and limited Dematha to 9 points to force OT. In overtime, the Stags made sure victory was to be had, as they outscored the Comets 8-3 to win 61-56. Dematha was led by Wagner signee Corey Henson with 33 points. Westchester was led by LMU signee Elijah Stewart with 32 points. The finale of the Nike Extravaganza featured 2 McDonald All-Americans and numerous D1 prospects. Whitney Young came out strong, I mean St. Louis signee Miles Reynolds. The PG for the Dolphins outscored Mater Dei 16-15 by himself. In the 2nd quarter, the Monarchs put the clamps on Reynolds and took a 37-34 lead at half. In the second half, Stanley Johnson the Arizona commit scored 18 points. 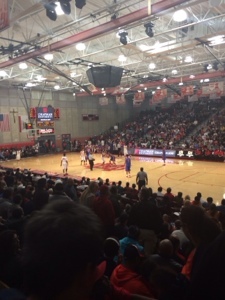 With timely shooting by Rex Pflueger(2015), 6’6″ G, and a stifling triangle and 2 defense used to neutralize Duke commit Jahlil Okafor, Mater Dei won 69-57. Johnson finished with 27 points. Pflueger scored 16 points and MJ Cage(2016), 6’10” C, had 12 points and 8 rebounds. Whitney Young was led by Miles Reynolds with 21 points and Okafor with 17 points.